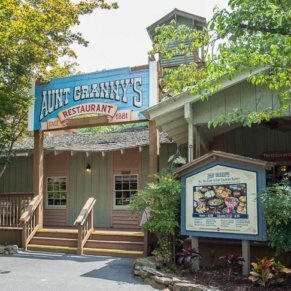 This big skillet breezeway is the place to go for some delicious grub. 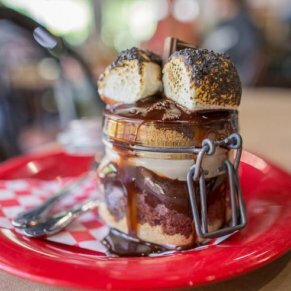 With some sandwiches and a couple sides that are reasonably priced, this is a great place for the whole family to grab some food. The hypnotic smell wafting from the covered walkway will draw you in. 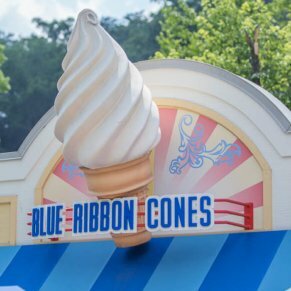 Once you’re there, you’re in for a treat! In this tunnel of deliciousness you’ll find Market Square Big Skillet Steak Sandwiches and Sausage Works! 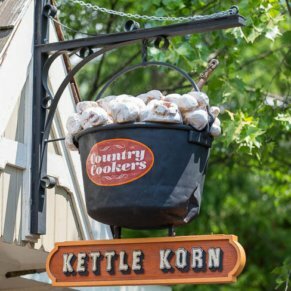 Both of these grab and go style eateries will have your mouth watering before you even see the food with the heavenly aroma that gets blasted out of the cooking area. When walking through Dollywood, you’re bound to go through this covered area at some point during the day. 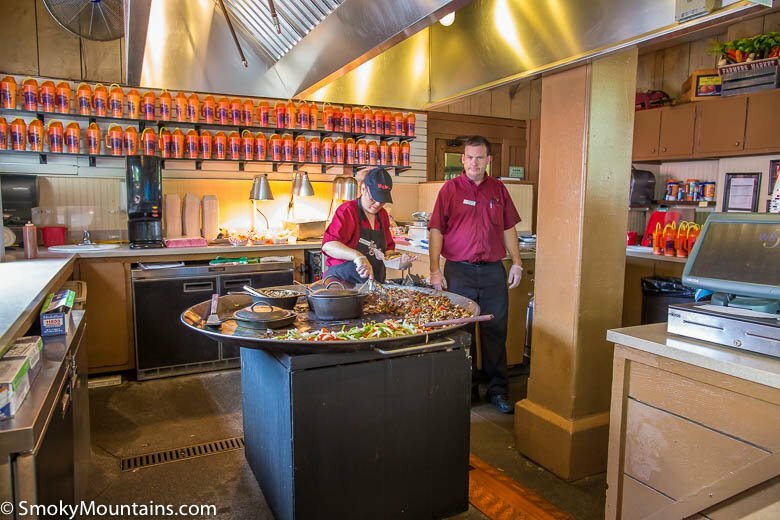 There are kitchens on both sides of the breezeway, and within them are GIANT skillets that are cooking up some good eats. You’re able to see your food as it’s being made, and in case you couldn’t tell, the smell is overwhelmingly appetizing. 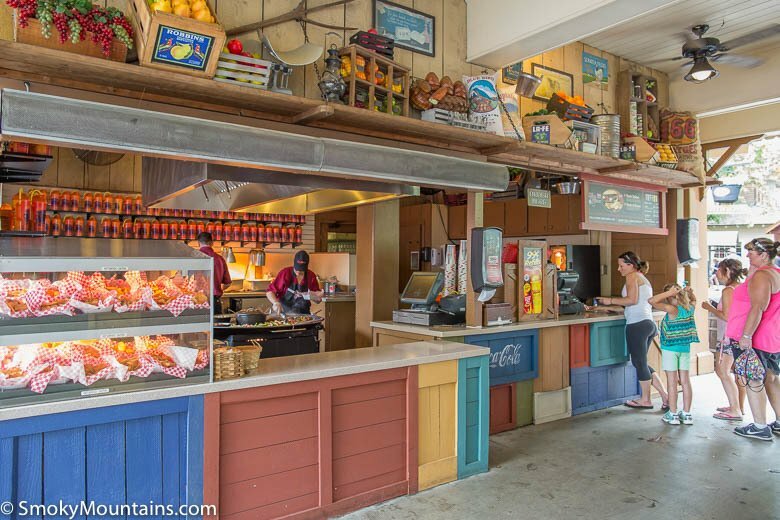 You’ll get the joy of seeing what you’re eating before you order at this breezeway for food. No unexpected surprises here! If you choose Market Square Big Skillet Steak Sandwiches to curve your hunger, your options for chowing down include exactly what the name implies: steak sandwiches. You can get one of these bad boys for $7.99. Your side options are chili cheese chips for $5.79 or potato chips for $2.49, both of which go great with the steak sandwich! If you’re in more of a sausage mood, walk on over to Sausage Works and grab yourself a honkin’ big sausage that’ll come on a sandwich roll for $7.99. These monster sausages are grilled up in the giant skillet as well along with some peppers and onions. If you’d like to skip the sandwich and go right for the sausage, get a sausage on a stick for $6.99. The same side dishes of potato chips and chili cheese potato chips are your options here as well along with chili cheese ribbon fries for $5.79. After you’ve got your food, make your way to one of the outdoor picnic tables to devour it! Once you take the first bite, the last one won’t be too far away; it’s hard to pace yourself with these delicious grilled sandwiches. We guarantee you won’t be disappointed with whatever you decide to get. You can find this walkway of goodness in the Rivertown Junction! Don’t miss it!